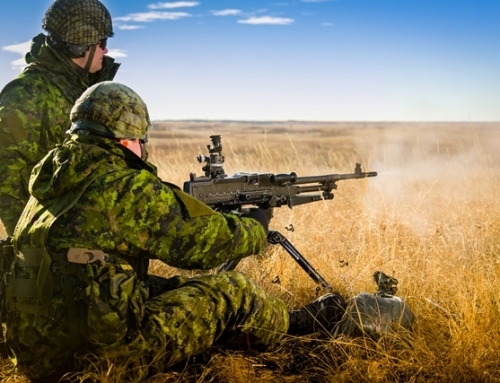 Submitted by Capt Rick Dumas, The Loyal Edmonton Regiment. 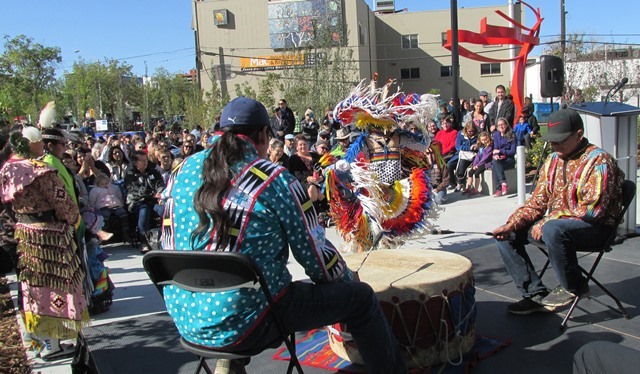 On 16 September 2017, the Alex Decoteau Park was officially opened and dedicated to his memory. It is Downtown’s first new park in over 30 years and features a community garden, ground-level water sprays, a fenced off-leash dog park and “Esprit” – a 16-foot sculpture by Canadian Artist, Pierre Poussin, honouring and celebrating the spirit and legacy of Alex Decoteau. 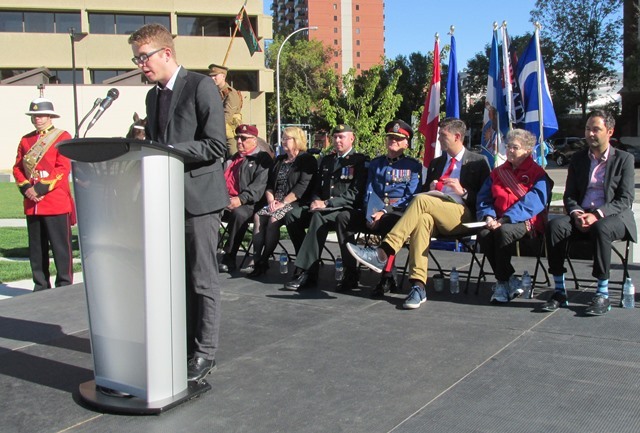 Mr. Chris Buyze, President Downtown Edmonton Community League, the Master of Ceremony, welcomes Edmonton’s citizens and visitors as the event commences. To his right is our Regimental Band’s Warrant Officer Warren Rubin. Seated are retired Airborne soldier and Elder, Mr. Clifford Pompana, Ms Janice Smith, Director Exhibits & Programming Canada’s Sports Hall of Fame, CO L EDMN R, LCol Jon McCully, Edmonton Police Service Police Chief, Rod Knecht, Mayor Don Iveson, representing the Decoteau Family, Ms Izola Mottershead, great niece to Alex and “Esprit” artist, Pierre Poussin. Alex Decoteau was active in many sports, exhibiting a natural talent for running, from his early days attending the Battleford Industrial School in Saskatchewan. He represented Canada at the Olympic Games in Stockholm, Sweden, 1912, finishing sixth in the 5000 metres event. He became the first Indigenous police officer in Canada when he joined the Edmonton Police Department in 1911 and was soon promoted to sergeant – in charge of the then No. 4 Police Station. In April 1916, Alex joined the 202nd Battalion, CEF, during the First World War. He continued with competitive running, while serving in the army – his athletic prowess was epic. 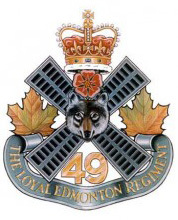 In May 1917 Alex transferred to the 49th Battalion, perpetuated by The Loyal Edmonton Regiment, to serve on the front lines. He was employed as a runner, delivering vital messages on the battlefield, between commanders and headquarters’ staff. He was killed at the Second Battle of Passchendaele on October 30, 1917. From the stage’s perspective at the park’s dedication service, a Drum Ceremony is conducted by the Yellow Ribbon Dancers, in traditional dress. To the right is the red monument, “Esprit”. Within the vicinity is the historical placard highlighting Alex’s legacy. For the full article open the following file.